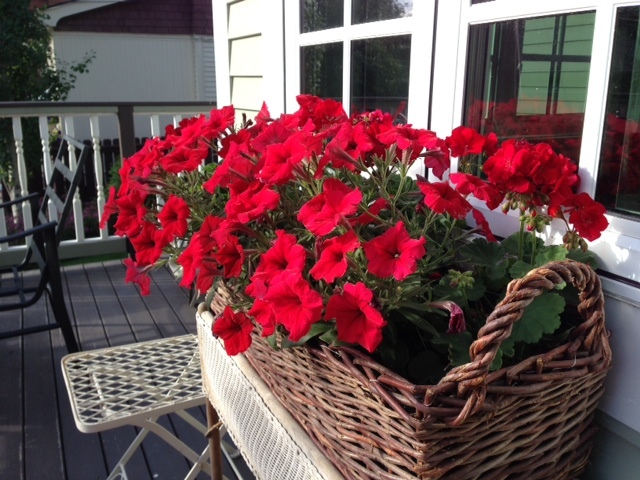 I love red petunias. They are so cheerful and make a strong visual statement. Gardens make any house look better and more approachable, but there is something about gardens and old houses that just seem to go hand in hand. I think it may be that old houses offer flexibility that contemporary homes do not. Contemporary homes use whatever materials that are in style, which makes sense. If you go into a new subdivision there is a good chance that most, if not all, the homes will look very similar – both in architecture and landscaping. There are fewer limitations of this type in older neighbourhoods. Because of the mix of architectural styles you get a lot of variety in gardens and landscaping. A 100- year- old Edwardian house can look great with formal gardens, as was the style back then, but country gardens were popular too. Our yard is a case in point. We chose the less formal route and have quite a mix of styles. From cottage to funky, from more formal to informal. A good way to reuse broken sidewalk slabs. In the front yard we broke old sidewalk blocks into various sizes to construct a curving, loose wall that helps to disguise the squareness of the yard. Recycling old sidewalk blocks is good for the environment and they are perfect to use to create a more informal look. The best blocks to use are the ones that are rough – those with rocks exposed on one side. The more imperfect, the better. Exposed bricks and old wood (left to turn grey or painted in a cheerful colour) are other materials that work well with informal gardens. Anything made of wicker or twig also looks good – regardless of its condition. I have a twig armchair that has outlived its life as a place to sit but it looks appealing under a big old spruce tree in the front yard. 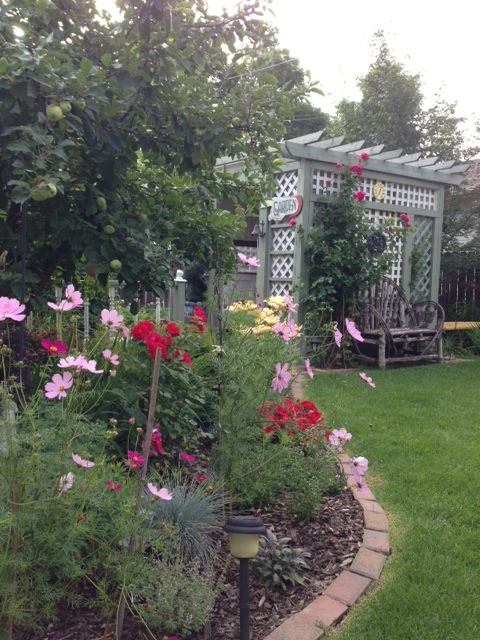 Informal plantings look good next to gazebos or sheds. Whimsical touches in our space include (but are not limited to) a collection of bird houses (including two that my dad built) statues and old signs. Naked fences are a perfect backdrop for signs that are colourful. Don’t put your valuable antique signs out there, though. Keep those protected and use reproductions as decoration. Let your individuality show through by pulling out some strange and wonderful things that may have absolutely nothing to do with gardens. When organized in a creative way, these objects inject personality into any garden. What kinds of things do you do in your garden to show off your creativity? 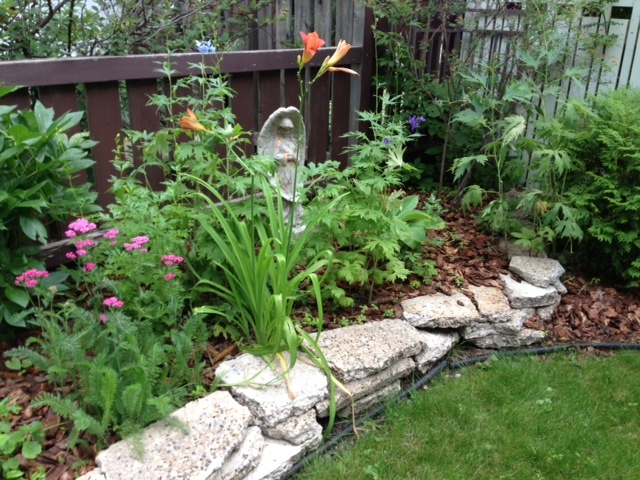 Love the pictures of your gardens Johanne! I try to garden so that something is always in bloom especially in the front of the house..first, black, orange flame, purple and white tulips, and of course, daffodils. These are followed by the Siberian irises, and then the tiger lillies…all against a back drop of purple Russian sage and later, purple sea holly. There are other purple sages and salvias, and mauve peonies. Lots of petunias for contrast in different shades of blue, purple and white. I use marigolds for the oranges, and as a natural bug and mosquito deterrent. I tried potato vine this year, liked it and will use it again. Its a very dark maroon colour. I plant lots of hostas under the weeping birch, with more lillies, deep maroon and bright lollipop pink and a big liguria…elephant ears for the dark purple foliage…and ferns, Must have ferns! We have a divided sidewalk, with a flower bed where the sidewalk forks. There, I put an expandable willow stick teepee and grew sweetpeas. They grew over seven feet tall this year! Under the office window, I grow sweet woodruff. IN the centre of that, is an old cedar stump that I put a big pot of shamrocks in …Lovely delicate scent. I try to use old fashioned plants and heritage seeds wherever possible. This year I created a bed on the other side of the walk for pansies. I use containers as well, and I can swap these out with fall plants as the season draws to a close. Our house is white stucco, with dark olive trim, and the porch is dark olive, light olive and terracotta…so I use a purple and orange colour scheme in the flower beds as those colours are complimentary, and look great with the young mountain ash out front too. Your garden sounds absolutely wonderful Beverly! Wow.